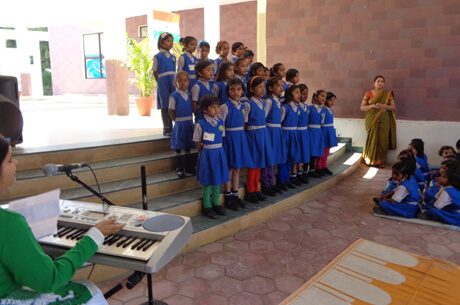 Sanskaar Vidhya Niketan is a school for the underprivileged girl child from the rural and semi-urban sectors in Bhopal. With the aim of giving underprivileged girls an opportunity to grow and bloom in a friendly and supportive environment, free from discrimination and negative attitudes, Sanskaar Vidhya Niketan is functioning under the auspices of Ramesh & Sharda Agarwal Foundation and The Sanskaar Valley School. The founder of the school embarked on this social stewardship initiative with a firm belief that when we ‘Educate a girl and you will educate a community'. The first center of Sanskaar Vidhya Niketan was set up in 2014 at The Sanskaar Valley School premises with 250 students receiving gratis education to grow into individuals who are literate, self-confident, motivated and emotionally stable. We believe that by educating each girl, we are not only transforming her life but positively altering many more lives associated with her. The ripple effect of this humble initiative will be felt in futurity too.